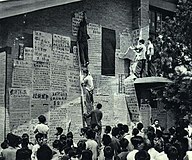 Having halted classes and toppled school administrations, the Red Guards then turned to enemies of the revolution in broader society. They ransacked homes of class enemies in search of incriminating evidence, smashed cultural relics deemed to be remnants of feudal culture, and struggled against political and cultural luminaries who were accused of following the capitalist road. Within one month of Mao's first rally on August 18, they ransacked 114,000 homes in the city, seizing 3.3 million items and ¥75.2 million in cash. 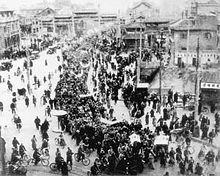 During the height of the Red Guard fervor in August and September, at least 1,772 residents were killed. 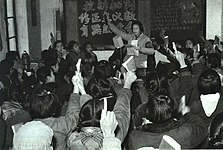 Many were driven to suicide or beaten to death by the Red Guards. Notable Beijing residents who took their own lives include deputy mayor Liu Ren, renowned writer Lao She and table tennis star and coach Rong Guotuan. Countless others suffered public humiliation, beatings and extrajudicial detentions at the hands of Red Guards and rebels. Many historical sites, including those designated by the city's historical protection bureau, were damaged or destroyed in the mayhem. Landmarks such as the Temple of Heaven, Beihai, Old and New Summer Palaces, Ming Tombs, Yonghe Lamsery and the Great Wall were also targeted. Almost all houses of worship were shut down. 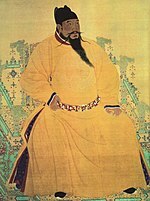 The Forbidden City was protected on the orders of Premier Zhou Enlai. Many city streets were renamed after revolutionary slogans. 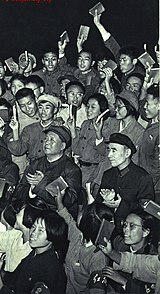 The Red Guards sought to rename the city itself as East is Red City. 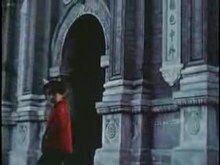 Dong, Madeleine Yue (2002). 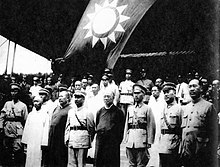 "Chapter 8: Defining Beiping - Urban Reconstruction and National Identity, 1928-1936". In Esherick, Joseph W (ed.). Remaking the Chinese City: Modernity and National Identity, 1900-1950. University of Hawaii Press. pp. 121–138. ISBN 0-8248-2518-7. Sheehan, Brett (2002). "Chapter 4: Urban Identity and Urban Networks in Cosmopolitan Cities: Banks and Bankers in Tianjin, 1900-1937". In Esherick, Joseph W (ed.). Remaking the Chinese City: Modernity and National Identity, 1900-1950. University of Hawaii Press. pp. 47–64. ISBN 0-8248-2518-7. Strand, David (2002). "Chapter 2:Citizens in the Audience and at the Podium". In Goldman, Merle; Perry, Elizabeth (eds.). 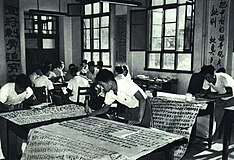 Changing Meanings of Citizenship in Modern China. Cambridge, Massachusetts, USA: Harvard University Press. pp. 59–60. ISBN 978-0-674-00766-6. Retrieved 2011-02-19.